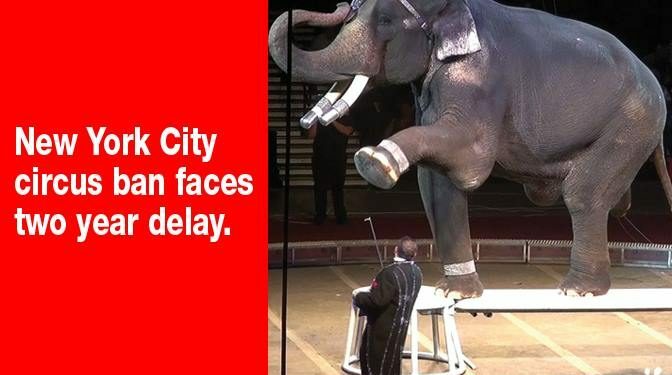 New York City’s wild animal circus ban could be delayed another 2+ YEARS. New York City’s wild animal circus ban, passed last year after more than a decade of work by CM Rosie Mendez, could be delayed another 2+ YEARS. If you live in NYC, the animals need you to take action today – please ask your Councilmembers and the Council Committee on Health to oppose Int 0057-2018. NYC CM Cornegy introduced Int. 0057-2018 last month to push its effective date from October 2018to December 2020. Another of several attempts by UniverSoul Circus to delay the popular ban, despite strong community and Council support, including that of now Speaker Corey Johnson. The Council already considered their request last year and agreed to a compromise, more than doubling the initial 6-month phase-in, to October 2018. Please act in good faith and honor the already extended date of October 2018.